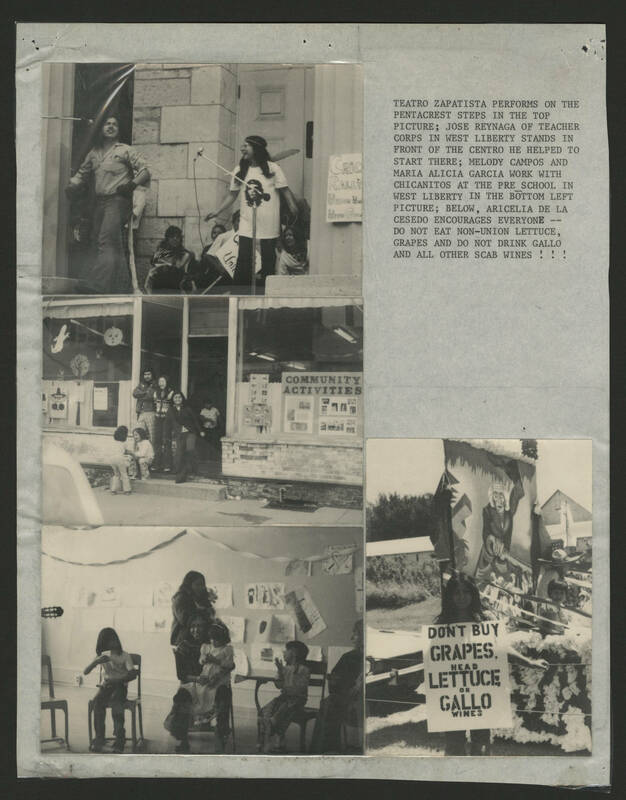 [[Images caption]] TEATRO ZAPATISTA PERFORMS ON THE PENTACREST STEPS IN THE TOP PICTURE; JOSE REYNAGA OF TEACHER CORPS IN WEST LIBERTY STANDS IN FRONT OF THE CENTRO HE HELPED TO START THERE; MELODY CAMPOS AND MARIA ALICIA GARCIA WORK WITH CHICANITOS AT THE PRE_SCHOOL IN WEST LIBERTY IN THE BOTTOM LEFT PICTURE; BELOW, ARICELIA DE LA CESEDO ENCOURAGES EVERYONE -- DO NOT EAT NON-UNION LETTUCE, GRAPES AND DO NOT DRINK GALLO AND ALL OTHER SCAB WINES ! ! !